As my time in San Francisco neared an end, it was time to head out to the airport and start the journey home. San Francisco has two British Airways flights a day so I arrived about five minutes before the earlier one was boarding, and just in time to see some friends of mine who were on the earlier flight and have a quick drink. 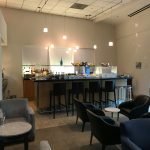 The lounge has two areas; a business class section open to those with oneworld sapphire status and a first class section, open to those with oneworld emerald status. 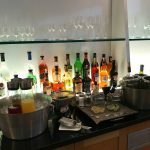 I had a business class ticket, seat 53K upstairs on the A380, however being a oneworld emerald joined my friends in the first class section of the lounge. My friend was fairly scathing of the first class room, however I didn’t think it was too bad. It was a reasonably quiet space with seating, some booze and some snacks. 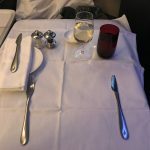 However the furniture was scuffed, the walls in a bit of a sorry state, and generally not befitting the words “first class”. 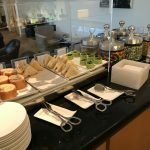 Certainly nowhere near the standards of the Qantas First Class lounge in LAX. Not awful, but not great. I got on with some work, using the reasonably fast wifi and a couple of hours later it was time to board. 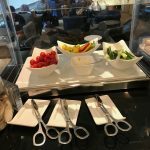 When BA operated only 747’s to San Francisco, it is actually possible to board directly from the lounge as gates A4 and A6 are directly connected. 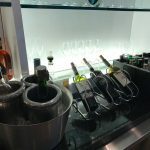 However neither are A380 capable, so the lounge agents kindly called us over to A9 when it was time to board, and where there was a separate priority queue for people in first and business. As I approached the podium the lady scanned my boarding pass and it flashed up red. That’s normally either a very good, or very bad sign. 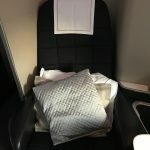 In this case, it was very good as the lovely lady from Special Services Connie (who has been awesome in the past), explained that they had to move me to an aisle seat, 1A. That of course was fine by me, so rather excitedly walked through door 1 to be greeted by a member of the crew who showed me to my seat. 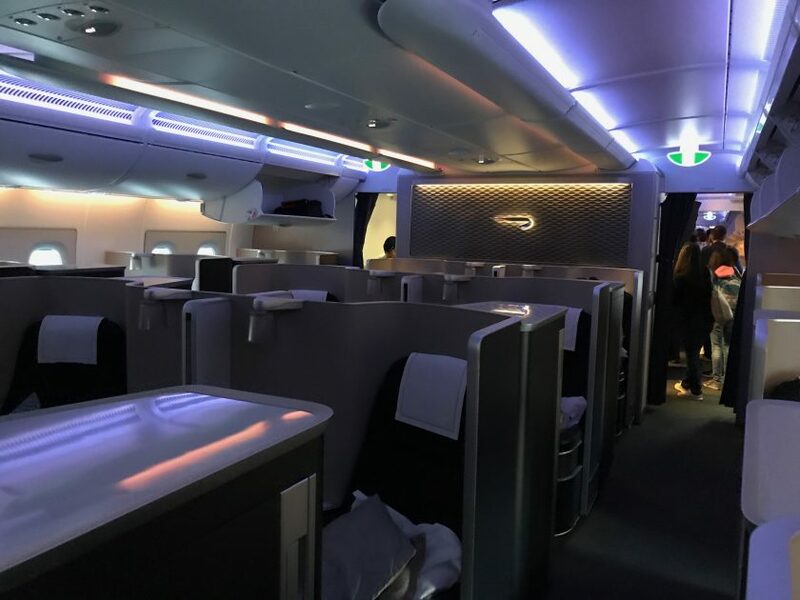 British Airways has fourteen first class seats on the lower deck of the A380, the same number that Qantas fits in the same space. 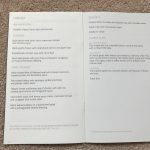 BA went for a 1-2-1 configuration with Qantas going a 1-1-1. Most other airlines have opted for either 8 or 12 seats, also in a 1-2-1 layout. What’s interesting is that whilst the suite takes up a large amount of space, quite a lot of it is dead space. The actual part of the seat for sitting or sleeping is essentially the same as the 777 and 747 product, just with a much larger surround. 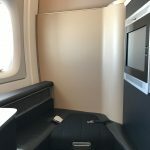 I personally find the Qantas layout as much more effective use of the available room. 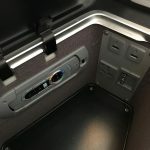 There was also a moderately sized fold-out screen, a couple of USB sockets for powering devices, RCA Video inputs and a universal 240V power socket in the rather large cubby hole to the left of the seat. A pre-departure glass of champagne was brought, the rather lovely Laurent Perrier Grande Siècle. And topped up too. Pyjamas and wash-bags were offered. The new safety video was also played, which is definitely an improvement from the very old animation. It was also the cabin crew’s first time watching it, so they chortled along. The Cabin Service Director a rather large, grey-haired, Italian sounding gentleman, mumbled a three second introduction to me and was never seen again for the rest of the flight. He was also chewing gum. 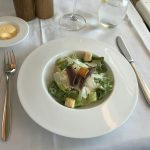 There couldn’t have been a bigger contrast from the friendly and engaged Maître d’Cabine on my outward journey with Swiss. After a bit of a wait to offload three passengers bags, we pushed back about twenty minutes late, and a further ten after that were safely into the air for the nine and a half hour journey back to London. 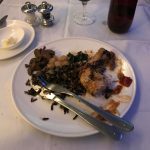 The crew had proactively taken the meal choices on the ground; I opted for the salmon to start and then the chicken for the main course. I was intrigued to note that they had Balik salmon on the menu. 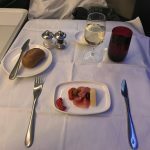 I had that on the way out with Swiss in first class as well, so chose that as I thought it would be an interesting point of comparison. 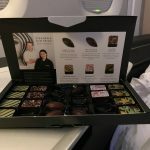 Perhaps British Airways have indeed upped their game? 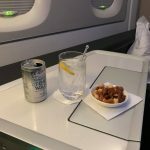 After about twenty minutes after take-off my gin and tonic arrived, albeit with slimline tonic and a bowl of warmed, caramelised nuts. 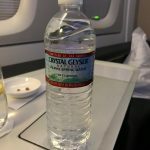 A bottle of water was also handed out. 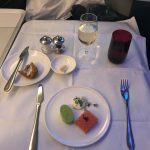 About 45 minutes later the cabin crew came around to lay the table for dinner and brought out the amuse bouche. 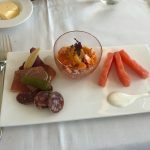 I opted for a glass of the St. Aubin to go with the starters. After a short while, the salmon starter came out. It was possibly the most minuscule piece of fish I’ve had described as a starter. There was probably two or three mouthfuls there at most. As a point of reference, I put the BA starter on the left with the Swiss starter (with other items from the trolley on the right). The fish was served with some green paste. As you can see, the single piece given by BA was about the same size as one of the three that Swiss served up. In addition to the lobster. In addition to the charcuterie. Having devoured that in around 30 seconds, I asked (rather than was offered) if it was possible to have some salad before the main course. That was no problem, and a fairly plain green salad was brought out. Again, I’ve pictured the BA one on the left and the Swiss one on the right. That was cleared away and the main course was brought out. It was possibly the driest piece of chicken I’ve ever tried in my life; it was utterly cremated. I managed about half of it before I gave up. 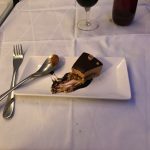 There was one saving grace which was dessert – I opted for the chocolate tart which was very good, in fact I forgot to take a picture before I started eating it! After that I decided to skip cheese, however the crew did bring round the box of chocolates with a glass of whiskey. Given we were a good two and a bit hours into the flight, I decided to get some sleep so changed into some pyjamas while my bed got made up. 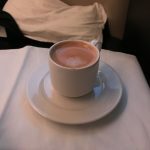 The bedding is fine, but simply a mattress pad and duvet, not as comfortable as other airlines like Qantas or Swiss provide. However that said, I managed to get a good six hours sleep before waking up about 45 minutes out of Heathrow. Not being a big breakfast person I just asked for a fruit plate and an espresso which they gladly brought me. That was cleared away, with the captain announcing 40 minutes to land on the tannoy very shortly afterwards. We landed on the northerly runway and there was a short taxi to the C gates, where a jet bridge was attached to D2L allowing us to disembark from the rear of the cabin. 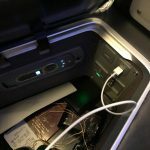 So how would I rate the flight? 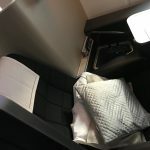 Well, firstly I was very lucky to get an upgrade and I must stress I was very grateful for that. However, if I had paid either miles or money for the experience I think I’d be really disappointed. In terms of the hard product, it’s ok, but not as well laid out or as private as many competitors. The wine and spirits selection was pretty good and remains a strong point of BA’s. 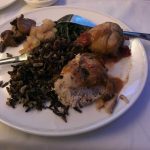 However the food was atrocious – putting things side by side with Swiss really shows how poor it is. 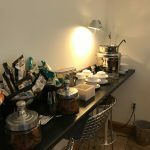 The crew were fine – they did the service but nothing extra was offered. There was little anticipation or going the extra mile. I know that some BA crews can be amazing, however these guys didn’t seem to have their hearts in it, which was a real shame. 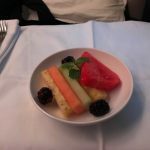 I wouldn’t go so far as to say avoid BA’s first class on the A380, but there are many, many better products out there. If it suits your schedule, then great, but do lower your expectations to that of a reasonably comfortable bed and some partially edible food. 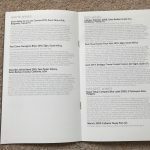 Previous Post: JW Marriott San Francisco. Sort of OK. Ish. Next Post: Swiss First Menus. 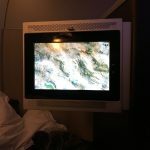 We flew BA first A380, and it was a good business class experience. 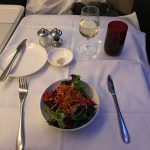 The food was awful, not first class at all. 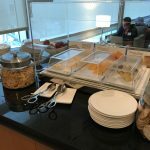 The food at the Concorde lounge was just bin worthy, I would only pay for BA if they happened to be much cheaper than other carriers. I would add I would NEVER fly club world, ever. It’s not an airline of choice for me.